Velan is deeply influenced by the discipline of Master Zhen Hua Yang, a Shaolin monk trained and guided in the temples of China. This lineage holds the energy of over 400 years, through the people who served as guardians of the Chinese Emperor. Velan shares layers of this lineage as a 3 dimensional form fusing Tai Chi, Qi Gong, and traditional Hatha yoga to awaken internal power, vitality, and stillness in motion. This form reveals a dynamic synergy between internal power and deep integrative moments of stillness. Connecting to the body’s innate wisdom, its desire to move and heal is the foundation of his teaching. 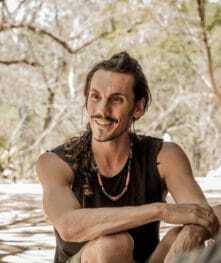 Unifying various styles into a creative flow of movement, he has been influenced through the study of Vinyasa Flow, Sivananda Yoga, and Yoga Therapy with Simon Borg Oliver. He studied Ayurvedic Medicine in Kerala, India, functional movement training in Sydney, Australia and has anchored a deeper understanding of the body through the study of various forms of healing work. In PachaMama YTT Velan shares his passion of Calligraphy Yoga, Ayurvedic principles of health and assessment, functional movement, energetic cultivation, healing, and free-form movement.